Why write an email to your readers solely for the purpose of prompting them to take action, especially after you’ve sent them an invitation or an appeal? No, you're not being a pest. Readers tell us that they want reminders. Two leading factors influence readers to take action, according to a survey from software fundraising company Classy. 1. The reader knows someone who is affected by the cause or works for the organization. Two leading factors prevent readers from taking action. 1. Negative press about the cause or the organization. In other words, readers respond when they are reminded. And readers forget to respond or feel slighted when they don’t receive reminders. The early Roman churches struggled to stay focused on Jesus. 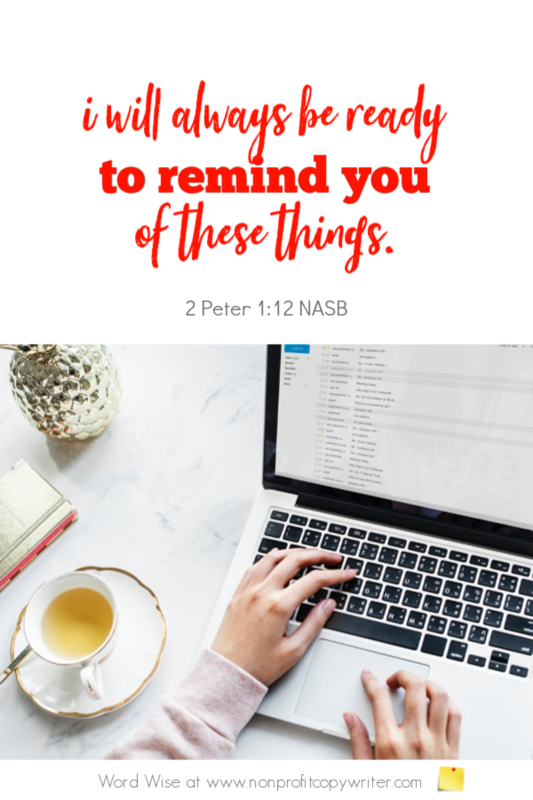 The Apostle Peter wrote two letters (1 Peter and 2 Peter) to these believers as a way of reminder ... and even pointed out to them that his letter was a reminder. Today’s readers are distracted. But you can follow Peter’s model. Write an email to your readers solely to prompt them to take action. You're not being a pest. They want to be reminded. Write an email reminder to prompt readers to take action. You know our human struggle to stay focused. Let me make the effort to communicate well with my readers. Show me how to write reminders so they feel valued and motivated. The Opt In: Why Do Readers Want to Receive Your Emails? The Call to Action: Is It Motivation … or Manipulation?